Housed inside the city’s train depot, the Whitefish Museum highlight‘s Montana’s rich logging history, the city’s famous literary local, its bond with the Great Northern Railroad and so much more. What can I see at the Whitefish Museum? Ever seen a fish with fur? Tapped out your name in Morse Code? When you’re visiting Whitefish you must plan a visit to the city’s charming museum and check out its one-of-a-kind curios and railroad paraphernalia. Managed by the Whitefish Historical Society, volunteers are on-hand to answer visitor’s questions. Although it’s only one room, the museum is packed with displays and collectibles, so it could take a few hours to admire it all. Stumptown: Outside the museum doors a large tree stump is displayed which is a homage to the city’s former name of “Stumptown”. The oversized-trunk stands as a reminder that before the railroad blazed its tracks through the city, the locals made their living off of lumber. Furry Fish: In addition to railroad memorabilia, the museum’s famous ‘Hicken’s fur-bearing fish’ is a big draw. It’s worth a trip into inside just to read the amusing story of this aquatic anomaly. Morse Code: There is also an interactive display which recreates the desk of Lucien Gordon Becquart, a telegrapher who worked for the Great Northern Railroad for 40-years. Try to tap out a message in Morse Code on the antique telegraph. Local Writers: A large display tells the story of Whitefish’s most-noted author, Dorothy M. Johnson, who penned the classics The Hanging Tree, A Man Called Horse and The Man Who Shot Liberty Valance. Where is the Whitefish Museum? 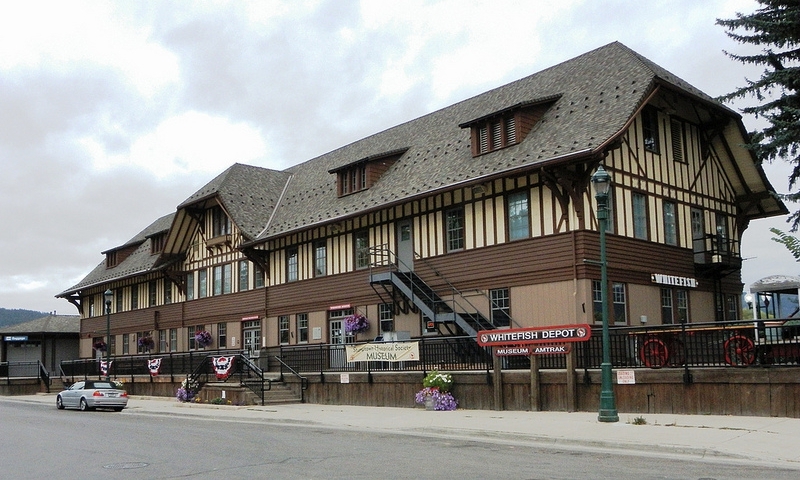 Whitefish Railroad Depot. 500 Depot Street, Whitefish. The museum is free, but a donation to the Whitefish Historical Society is greatly appreciated. For any questions about the museum call the Historical Society at 406-862-0067.